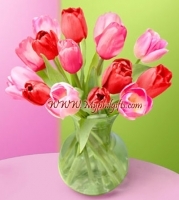 Vibrant fresh cut tulips will make a cheery display wherever they are displayed. We have selected shades of pink and red to make a cheerful spring bouquet. Your 12 stem bouquet arrives boxed and ready for the recipient to arrange in their own special way.